Azerbaijan has repeatedly stated that it is ready for a peace deal on the long-lasting Nagorno-Karabakh conflict. Foreign Minister Elmar Mammadyarov said Azerbaijan hoped that every meeting on the settlement of the Nagorno- Karabakh conflict would be effective and this process to be moved ahead. Mammadyarov made the remarks at a briefing on October 15, commenting on the upcoming meeting of Azerbaijani and Armenian presidents scheduled for late October in Paris on the initiative of French President Francois Hollande. 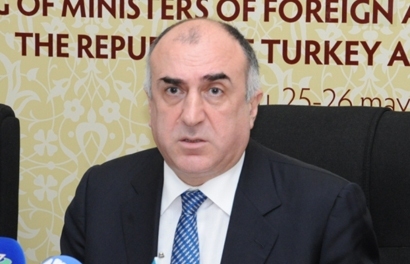 Azerbaijan is ready to work on a major peace agreement, Mammadyarov emphasized. He went on to say that there was a range of proposals for the establishment of working groups to resolve the issues of withdrawal of Armenian troops, return of refugees and transport, infrastructure. "Azerbaijan is ready to begin such negotiations at the expert level," the minister said, adding that it is waiting for a response from the Armenian side. For over two decades, Azerbaijan and Armenia have been locked in a conflict which emerged over Armenia's territorial claims against its South Caucasus neighbor. Since a war in the early 1990s, Armenian armed forces have occupied 20 percent of Azerbaijan's territory, including Nagorno-Karabakh and seven surrounding regions. A fragile ceasefire has been in place since 1994, but long-standing efforts by U.S., Russian and French mediators have been largely fruitless so far. Mammadyarov further urged the OSCE Minsk Group co-chairmen to pave the way for return of two Azerbaijanis' detained in the occupied Kalbajar region. He said President Ilham Aliyev also has called for immediate release of the hostages, while receiving the OSCE Minsk Group co-chairmen. Mammadyarov said they are civilians, not saboteurs and Armenia must release them. Armenian special forces killed Azerbaijani citizen Hasan Hasanov and took hostage Shahbaz Guliyev and Dilgam Asgarov in the Shaplar village of the occupied Kelbajar region on July 11. The civilians were visiting the graves of their relatives. The Armenian side returned Hasanov's dead body but the fate of two hostages is still unknown. Earlier, the Armenian media reported about holding a trial for the Azerbaijani citizens Guliyev and Asgarov. They are allegedly accused of murdering Armenian teenager among other charges.